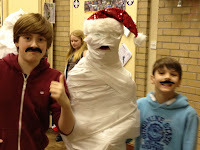 This week, scouts drew together their year of adventure with a party. last act of fun, madness and mayhem is a firm favourite with young people of all ages. Some traditional games, such as pass the parcel and relay games were played though its the more traditional 'flour game', 'mummy wrap' and the Oxclose dance-off that make the party just that little bit more messy and fun. The growth in our troops this year was only matched by the sausage mountain that towered above the buffet table. However, with 70 scouts across our two sites, the food was soon devoured! Adult volunteers managed music and kept things moving along quickly and were even spotted adorning scouts with spray string...a small reward for their hard work too! At the end of the party, a pertinent message left scouts with a challenge - to thank those around them who make Christmas a memorable time for them and to continue to think about those who are less fortunate than themselves. Our thanks to everyone who has supported another year of adventure in 2012. Happy Christmas!